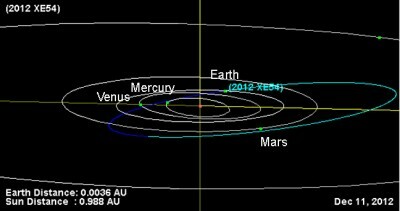 Discovered just yesterday, Asteroid 2012 XE54 will pass Earth tonight and in the early morning tomorrow. Its discovery is reported in the Minor Planet Center’s Minor Planet Electronic Circular 2012-X37. At its closest, it is now anticipated to be a little over one-half the distance from Earth to Moon (0.6 Lunar Distance). That’s close. In comparison, of the four anticipated passes in December, the closest was 2009 BS5 at 8.4 Lunar Distance. XD54 is small–estimated to be about 15×50 meters. It would fit easily within the boundaries of a soccer or football field. It is moving at about 13 kilometers per second. Besides its sudden appearance (these things happen) and its close pass (which also happens, but less often), it is particularly unusual because it is expected to pass through Earth’s shadow on its approach. This asteroid’s appearance is exciting. Some day each new asteroid may bring new resources to humanity. Some writers speculate that small asteroids will eventually be hollowed, filled with air and occupied. XE54 might be the right size to fill the role of Buster’s Tavern in my story, Early Retirement, or the End of the Line Club in my darkly-humorous flash fiction piece, Another Wrong World. But at present, each new asteroid brings crucial information about the objects with which we share the Solar System. Because of its sudden detection, XE54 also serves as a mild, but chilling reminder of the uncertainty presented by near-Earth objects. We do not yet know all of our small neighbors. Planets get hit from time to time, and Earth is no exception. So the more we know the better. This is just one of many reasons for important projects like the International Astronomical Union’s Minor Planet Center. The MPC operates at the Smithsonian Astrophysical Observatory, under the auspices of Division III of the IAU. It designates minor bodies in the solar system and natural satellites. The MPC also collects, computes, checks and disseminates astrometric observations and orbits for minor planets, comets, and natural satellites. Its operating budget derives from a NASA grant. Computer equipment used by the MPC is provided with support from the Tamkin Foundation. This entry was posted in News and tagged asteroids, celestial bodies, minor planet center, Near Earth Objects, science, Space. Bookmark the permalink.